CAI advances excellence in public policy through advocacy before legislative bodies, regulatory bodies and the courts by availing an extensive network of state legislative action committees, government & public affairs committees, lobbyists and staff. Homeowners Associations and Planned Communities. Parking in community associations is complicated. In a homeowner’s association or planned community, an owner may own their garage, carport, or driveway as exclusive use property. Associations having parking spaces that are deeded or permanently assigned need to be treated differently. Since ownership of parking spaces vary, the position of authority for installation needs to be considered. For example, if the governing documents provide for the permanent assignment of a parking space, and a unit owner’s parking space is unsuitable for the installation of a charging station governing boards will, where permitted under the governing documents, be faced with coordinating new assignments with at least one other unit owner whose assigned space is more suitable. CAI supports legislation or other public policies that incentive associations to provide for electric vehicle charging but allows for the unique needs and the ability of each association to best determine the most efficient method to provide for these needs. Legislation or policy must respect the financial capability of associations to provide for charging stations and allow associations to equitably allocate costs of charging stations to those who benefit. 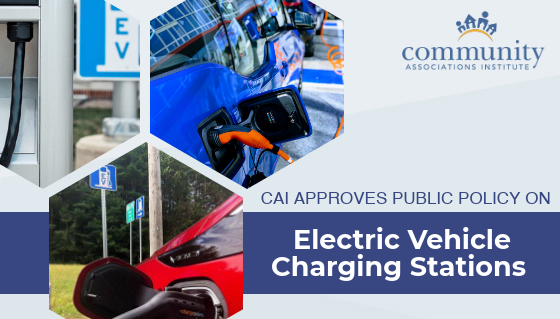 CAI supports legislation that permits a governing board or an architectural committee to review a written request by a unit owner for the installation of a charging station at a regularly occurring meeting or through the association’s normal approval process. CAI supports legislation that permits the association to impose reasonable charges to recover the costs of the review and permitting of the station. Further, CAI supports legislation that renders the benefited unit owners responsible for all costs associated with the installation, use, maintenance and removal of the charging station.